Heat oven to 375°F. In ungreased 13x9-inch (3-quart) glass baking dish, mix rice, corn, broth, tomatoes and beans. In heavy-duty resealable food-storage plastic bag, mix flour, chili powder, cumin and salt. Add chicken, 2 pieces at a time; seal bag and shake until chicken is evenly coated. 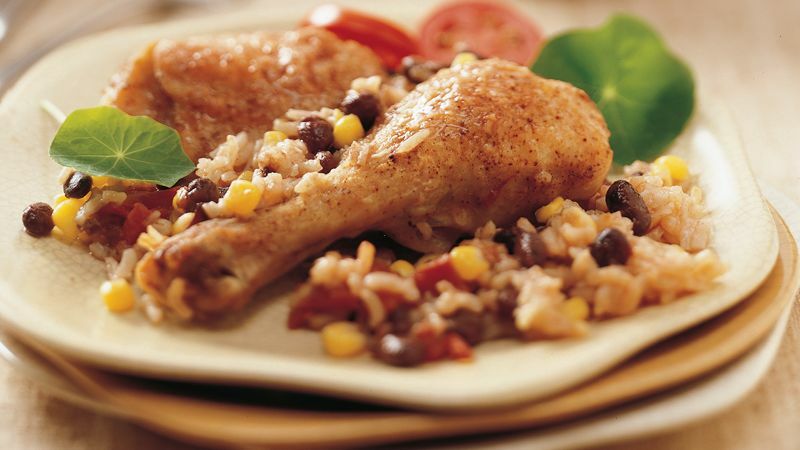 Arrange chicken, meaty sides up, on rice mixture. Cover with foil. Bake 1 hour 15 minutes. Uncover; bake 10 to 15 minutes longer or until liquid is absorbed and juice of chicken is clear when thickest piece is cut to bone (170°F for breasts; 180°F for thighs and legs). Using a resealable plastic bag for coating the chicken saves cleanup time and makes evenly coating the chicken a breeze!